The primary one is her health. As a child, Hilary paid little heed to seasonal allergies and severe PMS, even grew accustomed to auras evoked by her migraines. Her passion for learning overrode such concerns. Later, while studying Jurisprudence at the School of Economics in London in 1971, she finally sought medical care for severe leg and back pains. Unfortunately, a succession of doctors misdiagnosed her symptoms and prescribed antipsychotic drugs. Several hospitalizations followed. During these intervals of “insanity,” she began writing, eventually becoming a world-renowned author of historical fiction, short stories, and essays. Thus she abandoned a social work career for which she had prepared. Another “ghost” is Catrioner, the daughter she dreamed of having. In December 1979 she underwent a hysterectomy for endometriosis, the underlying cause of her previous ills, at London’s St. George’s Hospital. And there are still other “ghosts:” her unfinished works (“ghostly quality of words emanating from my center”); the “flickerings” of Jack, her deceased stepfather; and her spooked homes in England, Saudi Arabia, and Botswana. Several times, the author breaks into the narrative and addresses her readers. She decries the wooden style she uses in this memoir, unlike the textural rich images in her fiction. Handling her grief with its fingers of pain requires this approach. Yet these season Hilary Mantel’s continuing productivity. She has authored twelve novels of historical fiction; among them, Wolf Hall (2009) and Bringing Up the Bodies (2012) winning two auspicious Man Booker Prizes. Hilary Mantel teaches this writer to persevere in her craft. Thanks, Ginny. 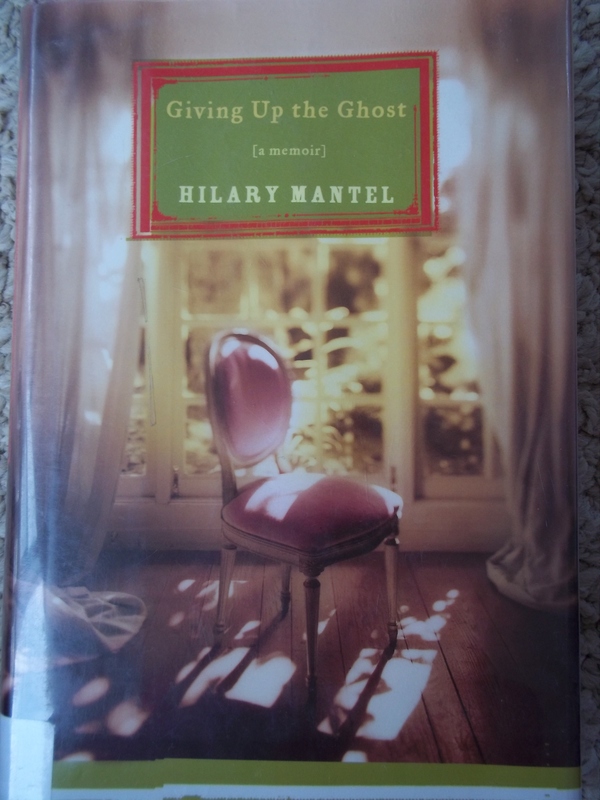 Have you ever read any of Hilary Mantel’s historical novels? Our book club recently studied Wolf Hall. Perhaps, I’ll see you tomorrow evening.